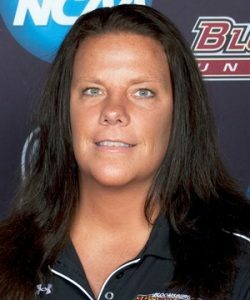 Diane Decker was previously the junior varsity coach and assistant varsity coach at Notre Dame High School in Easton from 1996 through 2001, and was an AAU coach and counselor for the Lehigh Valley Express in Allentown from 1991 through 2005. Decker recruited, developed and coached four 1,000-point scorers and three players who combined for four PSAC East Athlete of the Year honors – Kelsey Gallagher (2011, 2012), Catherine Noack (2014) and current ESU assistant coach Marla Simmons (2015). Gallagher earned All-America honors in 2011. Prior to coaching at ESU, Decker was head coach at Freedom High School in Bethlehem for three seasons (2002-03 through 2004-05). She coached the Patriots to an 82-15 record, reaching the District XI Playoffs all three seasons, and coached two 1,000-point scorers.